This strip was obtained from a woman who presented to her doctor’s office with hypertension. While there is some artifact in the baseline, it is possible to determine the presence of P waves, thanks in part to having two leads to assess. We have provided an unmarked version of the strip for you to use, and also a marked version for the sake of this discussion. The underlying rhythm is sinus bradycardia, at about 60 bpm, but with some slight variation in the P to P intervals (about 920 ms to 1040 ms). Because of the artifact, it is difficult to determine the exact P to P intervals, and the exact morphology of the P waves. So, we can’t say for sure that the P waves are all alike. The AV block occurs at a 3:1 ratio. That is, for every three P waves, one is conducted and produces a QRS complex. When the P waves are not conducted, an escape rhythm occurs. The escape rhythm occurs at an escape interval of about 1720 ms. In other words, when a QRS does not occur by that time, the escape beat is produced. It appears to be from the AV junction, in spite of the slow rate, because the escape QRSs look like the sinus conducted QRSs. Both sinus and junctional rhythms are conducted along the bundle branches and produce the same QRS morphology. The QRS complexes are approximately .08-.10 seconds wide. Note that QRS complexes numbered 3, 5, and 7 have a P wave fused to the beginning of the QRS, making the QRS look wide when it is not. 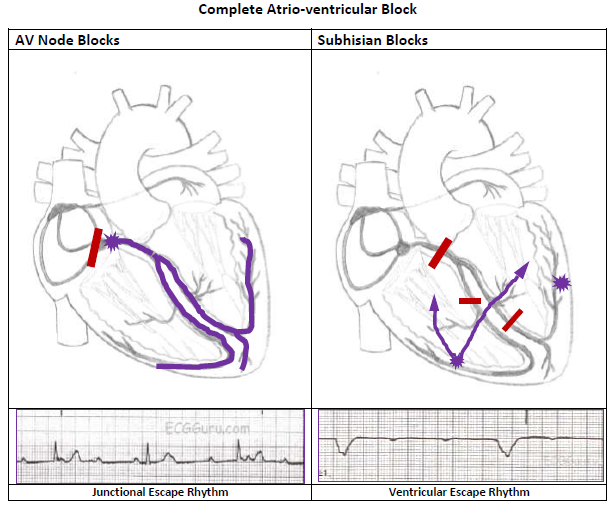 A junctional escape rhythm results from AV block in the AV node, as the junction is the first available pacemaker below the AVN. This patient was scheduled for a treadmill stress test in her doctor’s office, which was cancelled. She had no cardiac symptoms at the time of the ECG, except the above-noted hypertension. Unexplained bradycardia, especially when accompanied by AV node blocks, should trigger an assessment for inferior wall M.I., since the inferior wall of the LV shares a blood supply with the SA and AV nodes in the majority of people. Today's basic rhythm strip illustrates second-degree AV block, Type II. Even though there is fine baseline artifact present, it is easy to measure the P-to-P interval, and your students will be able to see that every third P wave falls in the T wave. The PR intervals are constant and the atrial rate is about 110/min. The ventricular rate results from a 3:1 conduction ratio, and is less than 30/min. For your students who have learned about bundle branch block, this strip shows a right bundle branch block, which is very common in second-degree Type II blocks, as they usually represent "intermittent tri-fascicular block" - that is, two of the three fascicles in the bundle branches are blocked, and one is intermittently blocked. Other combinations of complete block and intermittent block are possible, resulting in intermittent failure of conduction. This strip can start a lively classroom discussion about treatment of bradycardias. See comments below for discussion of terminology, second-degree AVB and high-grade AVB. This strip can be used as a good example of high-grade AVB. This 67 year old man is noted to have a slightly irregular pulse. At the beginning of this ECG, he appears to be in NSR with a first-degree AV block. Twice, P waves are non-conducted. Careful measurement of the P to P interval shows that it is regular, there are no PACs noted. The PR interval changes very subtly by lengthening just before the non-conducted P waves. A hint when non-conducted P waves are noted, first check for non-conducted PACs. If the sinus rhythm is regular, check the PR interval before the non-conducted beat, and the PR interval immediately after the non-conducted beat. You will see the PRI preceding the non-conducted P is longer than the PRI after the NCP. Wenckebach conduction is caused by RP/PR reciprocity. In other words, the shorter the RP interval, the longer the PR interval. So, as the PRI lengthens, the QRS "moves" to the right, eventually causing the next regular sinus P wave to fall into the refractory period and fail to conduct. This results in a pause, or a long RP interval, which shortens the next PRI. If you or your students would like to review AV Blocks, go to this LINK for Dr. Grauer's excellent, FREE, self-directed tutorial. For a slightly more advanced discussion of RP/PR reciprocity, see Jason's Blog.